KABUL, Afghanistan — Some Afghans lined up for hours to cast their vote Saturday in a chaotic start to the country’s first parliamentary elections since 2010. In some parts of the capital Kabul, voters waited for polls to open five hours after the official opening time of 7 a.m. In some of the city’s western neighborhoods, voters were posting pictures of closed polling stations hours after they were scheduled to open. As the extent of the delays began to be known, Election Commission Chairman Abdul Badih Sayat extended voting till 8 p.m. at polling stations that opened as many as six hours late. For those polling stations that were still closed six hours after the 7 a.m. polling start, Sayat said they would vote on Sunday. Poll workers struggled with a new biometric system meant to curtail fraud were late additions to Afghanistan’s elections. It had not been tested in the field and workers had not had more than a few weeks to learn the system. Also, in several polling stations, workers took an extraordinary amount of time to locate names on voter lists. In some polling stations in Kabul, voting started considerably late, leading to small disturbances by frustrated voters, some of whom had come to vote nearly two hours before polls opened. The chaos at the polls could compromise the legitimacy of Saturday’s vote in the minds of many Afghans, who have already expressed fears of fraud aimed at keeping the warlords and politically corrupt who currently dominate Afghanistan’s Parliament in power. Sayat said dozens of teachers who had been trained in the new biometric system had not shown up for work at the polling stations. It wasn’t clear whether that was related to a Taliban warning directed specifically at teachers and students telling them to stay away from the polls. It also wasn’t immediately clear how many of the 21,000 polling stations across the country would be affected by the new closing time. 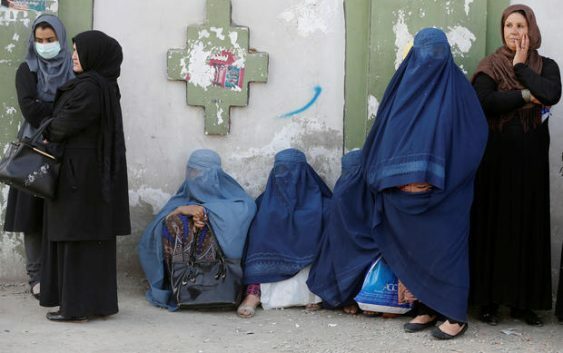 Afghan women line up to cast their votes during a parliamentary election at a polling station in Kabul, Afghanistan, October 20, 2018. Afghanistan’s deputy chief executive Mohammad Mohaqiq expressed outrage. “The people rushed like a flood to the polling stations, but the election commission employees were not present, and in some cases they were there but there were no electoral materials and in most cases the biometric systems was not working,” he said. Meanwhile, the Defense Ministry said it had increased its deployment of National Security Forces to 70,000 from the original 50,000 to protect the country’s 21,000 polling stations. Since the last election, Afghans hoping to bring change to a corrupt government have endured a resurgent Taliban that have carried out near-daily attacks on security forces, seizing large swathes of the countryside and threatening major cities. The Islamic State of Iraq and Syria (ISIS) affiliate, meanwhile, has launched a wave of bombings targeting the country’s Shiite minority, killing hundreds. Within hours of the start of polling, several minor incidences of violence had occurred in Kabul as well as several provinces as both the upstart ISIS affiliate and the Taliban have vowed to disrupt elections. In the lead-up to election, 10 candidates were killed, BBC News reports. Afghan men line up to cast their votes during a parliamentary election at a polling station in Kabul, Afghanistan, October 20, 2018. Nearly nine million voters are eligible to cast their ballots in the elections, which are being held more than three years late, according to the BBC. More than 2,500 candidates, including many women, are competing for 250 seats. Many of those running are well-educated and young, and vow to help bring change to the country, the BBC reports. Commission deputy spokesman Aziz Ibrahimi said results of Saturday’s voting will not be released before mid-November and final results will not be out until later in December.